Hot, summer date nights in the city are such a beautiful thing. For Brandon's birthday we decided to try out Buca Yorkville for the first time. Getting dressed up into something a little out of the norm is always fun. Crop tops and midi skirts are nothing new for me, but a crop and a tight pencil skirt? Hello, scandalous! I loved getting dressed up in this for a night on the town! 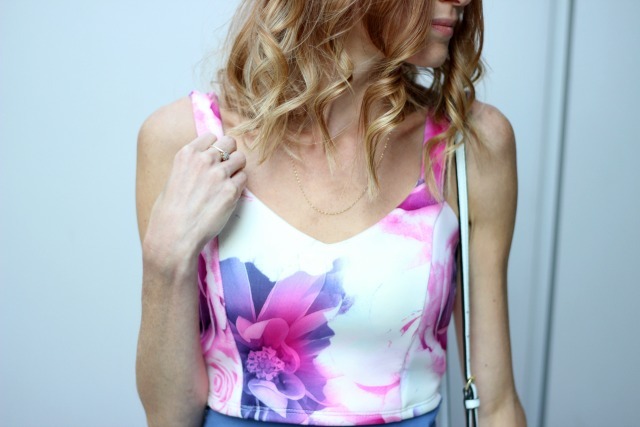 I am absolutely obsessed with the colours in this crop, the floral pattern and I love how it screams summer paired with this periwinkle skirt. Valentino Rockstud's were the perfect compliment to this outfit. We had the most amazing dinner, then headed to Deq Terrace and Lounge for a toast to his special day. I think it's great to dress out of your norm every once in a while and shake it up. If you're feeling shy, a glass of bubbly always helps! Is this something you do often? Sweetest top and love the details in the bag and shoes! You are just always so gorgeous!! Loving that blue with your floral and gorgeous pumps! Aww thank you Amy Ann! You're too sweet. Thanks Candance1 It's a fun change from the everyday look that's for sure! Love the colors in this top. The shoes are fabulous as well! The colours are definitely what sold me! I'm obsessed! This is such a cute flowery top - you look lovely! I am a floral hoarder! haha Thank you, Carmen! Such a fabulous outfit! The colors are so gorgeous! You are looking so beautiful dear, amazing color! You're too sweet! Thank you Erika. This outfit is simply stunning & so complimentary to your gorgeous hair colour! Thank you Cristina! I love my blues! !